Treasury Secretary Steven Mnuchin accused the Russians of "destructive cyber-attacks, and intrusions targeting critical infrastructure". He said the sanctions would target "ongoing nefarious attacks" by Russia. The measures are being described in Washington as the strongest action taken by the Trump administration thus far against Moscow. Russia says it has already begun drawing up counter-measures. Five entities including the Russian military intelligence agency GRU are targeted in Thursday's sanctions. Also blacklisted is the St Petersburg-based Internet Research Agency, which is accused of engineering an online disinformation campaign to sway the 2016 US presidential election. 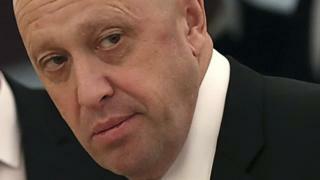 Yevgeny Prigozhin - an oligarch who allegedly ran the agency and is known as "Putin's chef" - and 12 of the agency's staff are also hit by the sanctions. 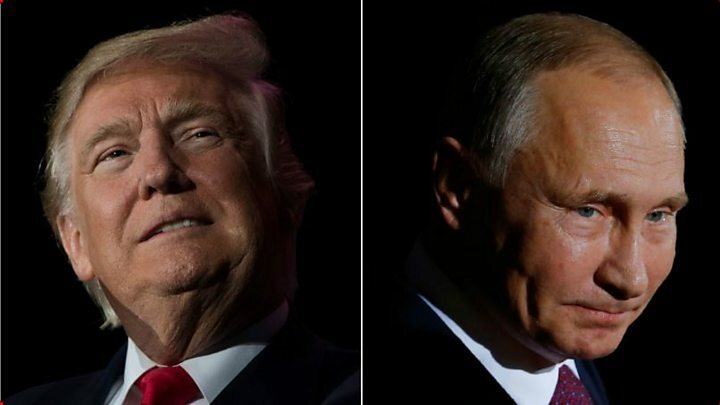 All 13 were charged in a February indictment by US special counsel Robert Mueller, who is investigating allegations that Russia meddled in the US vote to help Donald Trump win. Under the US sanctions, the Russian Federal Security Service, or FSB, and six of its employees are subjected to penalties for cyber-attacks. The US treasury secretary said there would be additional sanctions to hold Russian "officials and oligarchs accountable for their destabilising activities". He did not specify when these penalties would be imposed, but stated they would sever the individuals' access to the US financial system. "The IRA [Internet Research Agency] created and managed a vast number of fake online personas that posed as legitimate US persons to include grassroots organisations, interest groups, and a state political party on social media," the Treasury Department statement said on Thursday. "Through this activity, the IRA posted thousands of ads that reached millions of people online." The penalties freeze any assets the individuals and entities may have in the US and prohibits American citizens from conducting business with them. The Trump administration also accused Russia on Thursday of an ongoing operation to hack and spy on the US power utilities. US officials say the Russians hacked computer systems to conduct "network reconnaissance" of systems that run the American electricity grid and other industrial infrastructure. More than 16 months after the 2016 presidential election, more than a year after the US intelligence community concluded the US had been targeted by Russian hackers and influencers and 45 days after the congressionally mandated deadline to impose punitive sanctions on Russia, the Trump administration has acted. Interestingly enough, the list of individuals and groups identified by Department of Treasury for punishment appears to have relied on the efforts of Robert Mueller's independent investigation into Russia's election meddling and possible ties to the Trump campaign - an inquiry the president has called a baseless "witch hunt". The statement from Treasury Secretary Steve Mnuchin referenced Russia's "ongoing nefarious attacks". That was in sharp contrast to Mr Trump's White House comments on Thursday in response to a question about Russian activities, saying the UK nerve agent attack "looks like the Russians are behind it" and that he takes it "very seriously" - while declining to discuss the new sanctions at all. The US has condemned the poison attack, but it has yet to follow the UK's lead and take direct action against the Russian government in response. Unlike the election-meddling charges, the US may have to move more quickly in this case. Russian Deputy Foreign Minister Sergei Ryabkov said Moscow was calm about the new sanctions, according to Interfax news agency. Mr Ryabkov said Moscow had already begun drawing up retaliatory measures. Meanwhile Mr Prigozhin said he was unconcerned by the sanctions on him because he did not have any business interests linked to the US, Russian media reported. "I have been sanctioned maybe three or four times - I'm tired of counting, I can't remember. I don't have any business in the United States or with Americans. I'm not worried by this. Except that now I will stop going to McDonald's," he was quoted as saying by RIA news agency.